Kings of Pastry streaming: where to watch online? The collar awarded to the winners of the Meilleur Ouvrier de France (Best Craftsman in France) is more than the ultimate recognition for every pastry chef - it is a dream and an obsession. The 3-day competition includes everything from delicate chocolates to precarious six foot sugar sculptures and requires that the chefs have extraordinary skill, nerves of steel and luck. The film follows Jacquy Pfeiffer, founder of The French Pastry School in Chicago, as he returns to France to compete against 15 of France's leading pastry chefs. The filmmakers were given first time/exclusive access to this high-stakes drama of passion, sacrifice, disappointment and joy in the quest to have President Sarkozy declare them one of the best in France. 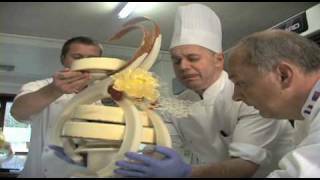 Currently you are able to watch "Kings of Pastry" streaming on Fandor, Hoopla. It is also possible to buy "Kings of Pastry" on PlayStation, Apple iTunes, Google Play Movies, YouTube as download or rent it on PlayStation, Apple iTunes, Google Play Movies, YouTube online.